The Wall-Mounted Work Table from Lifetime Products is the perfect work and storage solution for your garage or shop area. 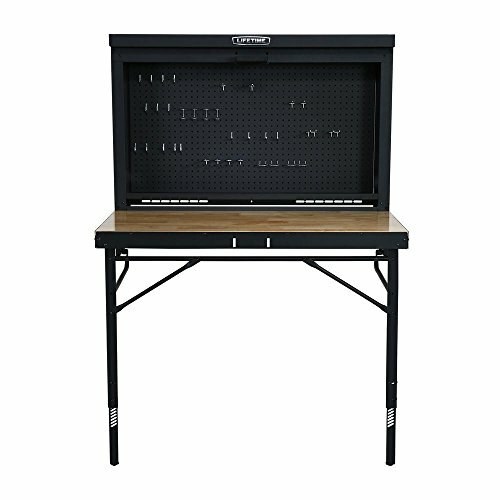 This unique folding table is constructed of water-resistant wood with a heavy-duty metal frame. The sturdy steel frame has a powder-coated finish that protects against weather, rust and corrosion and the wood table surface is made of water-resistant durable wood. Included in the design are interior and exterior pegboards to add hooks for tool storage and the exterior loop will fit any standard padlock, keeping your tools safe and secure. The table also has a convenient fold-up design to make storage simple.